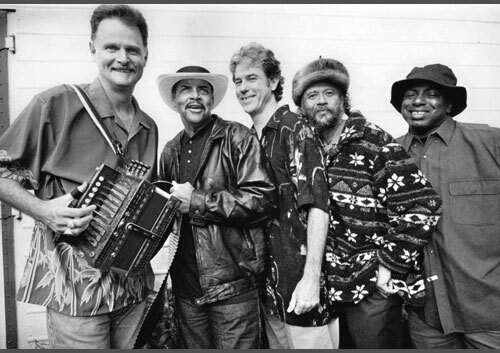 Formed in 1989, MotorDude Zydeco plays the infectious dance music of the Creole people of Southwest Louisiana known as “zydeco.” The Acadians (Cajuns), who had come from France via Canada in search of political freedom, originally brought the music to Louisiana. Adopting the adapting the music of the Cajuns, the Creoles added their own bluesy, rockin’ elements and called it zydeco. MotorDude Zydeco has become one of the leading exponents of this raucous style. Having performed in a wide variety of venues throughout the Bay Area and beyond, the band has developed a strong following of dancers who practice the traditional waltzes, two-steps, and zydeco-shuffle dance styles. Through the efforts of MotorDude Zydeco and other local acts, the Bay Area has become the most thriving Cajun and zydeco scene outside Louisiana. Utilizing the instrumentation of piano accordion, button accordion, fratoir (or rubboard), guitar, bass, and drums, MotorDude Zydeco creates a distinctive yet roots-oriented music blending traditional zydeco with original songs and rhythm and blues. The group packs any dance floor. This entry was posted in Cajun/Zydeco, World Music. Bookmark the permalink.